Few riders begin their life of off-road adventures as an adult. Most were first dipped in the world of riding when they were young and every trail led to exploration and every lap around a backyard track delivered a thrill that could be found nowhere else. For many it began as a family affair, with friends or relatives that made the world a little bigger and more filled with wonder. Once tasted, that feeling would never go away. It doesn’t take much coaxing to introduce a new rider to ATVing, and they usually take to it like ducks to water. It’s important to get new riders started correctly, however, with full safety gear, but also with a machine built to last. 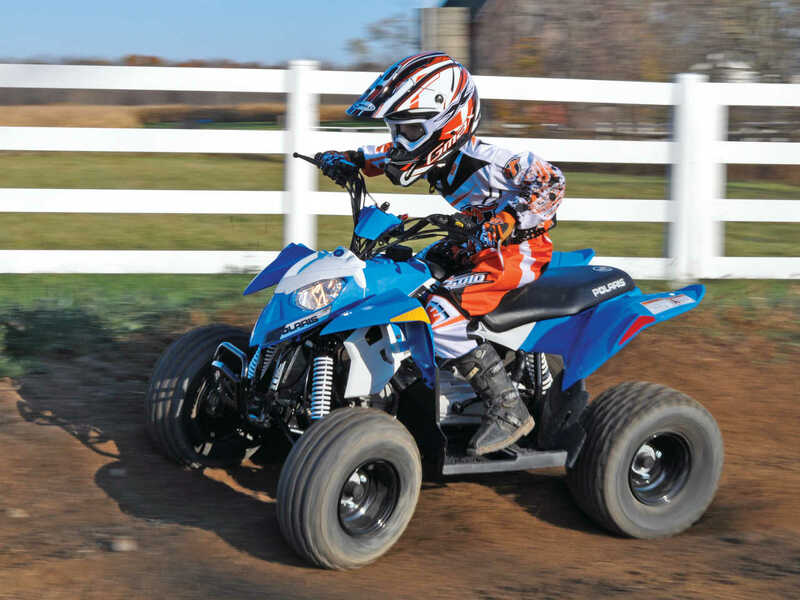 There are hordes of small ATVs available, but only a handful we would recommend from legitimate manufacturers that offer safety training, dealer support, and spare parts. One of the best is the Polaris Outlaw 90. With one of the most complete lineups in the sport, Polaris wasn’t about to leave youth riders out of the party, and they’ve got several models for the cookies and graham cracker crowd. The Polaris Outlaw 90, and the Outlaw 50 for that matter, are styled and even named after the discontinued Polaris Outlaw sport ATV models. Styling is definitely on the sporty side as well, with front and rear fenders that provide good splash protection for the rider, and a full floorboard for the rider’s feet. Ordinarily on a sport machine, we would not want full floorboards, but on a youth machine the extra foot protection is a good idea. A small foot peg is built in as well, but we would prefer a peg that had more distance above the floorboard. This would anchor the foot better, and allow the rider to pivot their foot as their body shifts position. 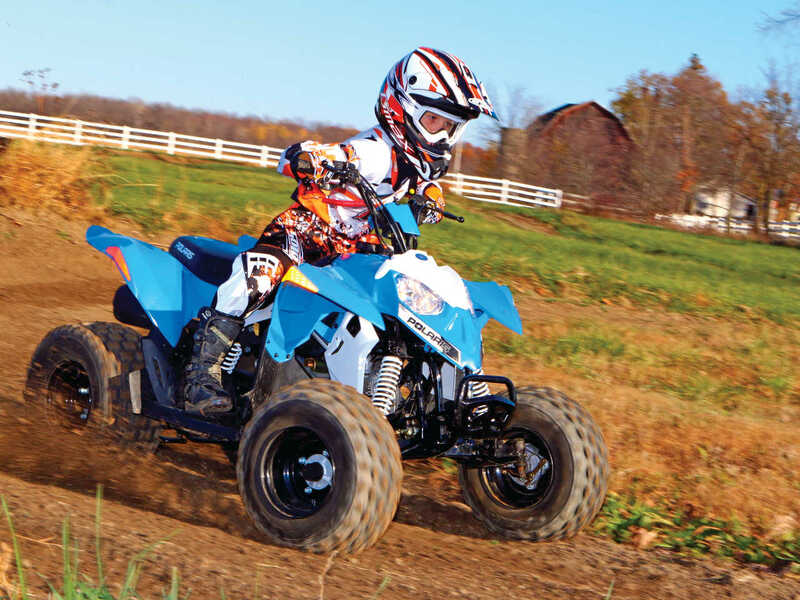 Overall the Outlaw 90 is slightly bigger than most of the other youth ATVs, but slightly smaller than Honda’s TRX 90. Like many Polaris models, especially the old Scrambler line, the Outlaw 90 has unusually tall handlebars. While we usually prefer a lower bar for sport riding, on a youth model it does get the rider’s elbows up for better leverage when turning. At the center of the steering column are the key and a couple warning lights (Neutral and Reverse). The Polaris youth models also come with a tether kill cord which a rider fastens to their pants. Should things get a little out of hand, as they eventually will with new riders, the cord will pop a switch and kill the engine. It’s a great safety feature for beginning riders. Controls are pretty basic on the Outlaw 90; there is a starter button on the left handlebar along with an ignition switch, and a choke lever. On the right handlebar is a thumb throttle with a limiter that parents can set while junior hones his/her riding skills. Just ahead of the rider’s right knee is the gear shifter with forward, neutral, and reverse. Although the Outlaw 90 comes with electric start, there is a backup kick starter on the left side of the engine as well. Most youth ATV chassis designs aren’t exactly known for their ground breaking geometry. It’s more about reliability than race winning features. The Outlaw 90 frame is pretty basic as well, with single front A-arms, and a steel swingarm at the rear. Shocks are sealed, non-adjustable, and non-rebuildable, but that is standard for the class. What Polaris does lead in, though, is suspension travel. The Outlaw 90 offers 5 inches of wheel travel in the front, and 6 inches at the rear, which is about twice as much as most competing models. The extra suspension makes a huge difference when soaking up bumps along the trail. Polaris uses drum brakes at both ends, and if you do much mud riding, be ready to clean them out to keep them stopping smoothly and safely. Ground clearance is 4 inches. Overall, we find the chassis construction to be quite good. Other unique features include daytime running lights, a rear tail light, and a safety flag. The engine on the Polaris Outlaw 90 is an 89cc, two-valve, single overhead cam, air-cooled, four-stroke and it can trace its roots back to a road legal vehicle. Scooters have small displacement engines and CVT drive systems, and Polaris manufacturing partner AEON makes them by the truckload. 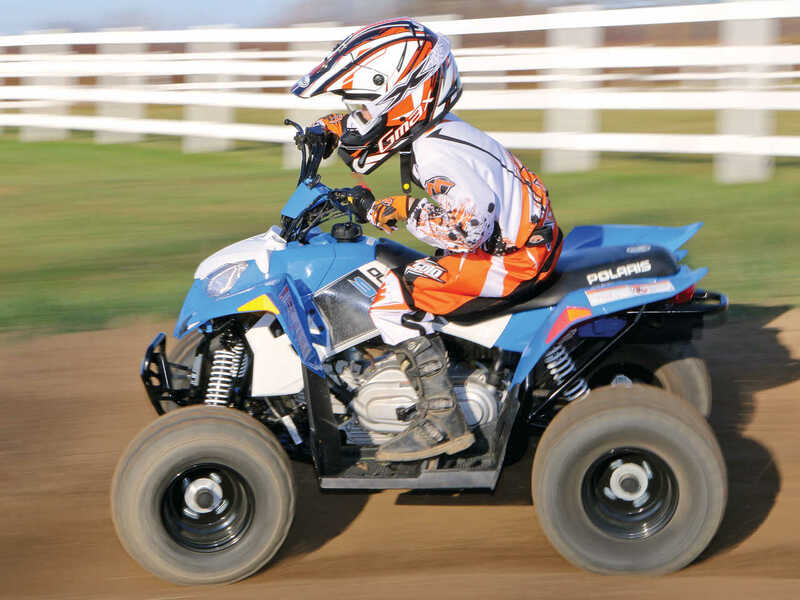 This type of setup is perfect for a youth ATV since CVT systems are very rider friendly and only require the rider to shift into either Forward or Reverse, and with a stab at the throttle, they are off. Maintenance on the little Outlaw is pretty easy. There is an oil check dipstick on the right side of the engine, and since it’s air cooled, there is no radiator to worry about. Air is filtered through a simple, flat foam filter located in an airbox under the seat. On the trail the Outlaw 90 seemed to get very good fuel economy. Mechanical features mean little to most youth riders; they just want to get on the trail. We had the perfect test rider for our Outlaw 90 ride. Timmy Bengel is the son of editor Pete Bengel, and he’s grown up riding everything from mini-motocross bikes, to youth race quads, to little snowmobiles. Timmy clearly has riding in his genes! When it came time to evaluate the Polaris Outlaw 90, we could do no better than let Timmy put in some extended seat time. After a couple months of riding, here is what he likes. The Outlaw 90 fires up easily thanks to the electric start system and the handlebar mounted choke lever. Overall the Outlaw 90 feels stable due to its wide stance and handling is quite good. In fact, Timmy prefers the Outlaw 90 to other models in the garage. Suspension action is also superior to other models in the class, especially considering it is non-adjustable. The Outlaw 90 feels roomy and a rider can shift their body as needed. 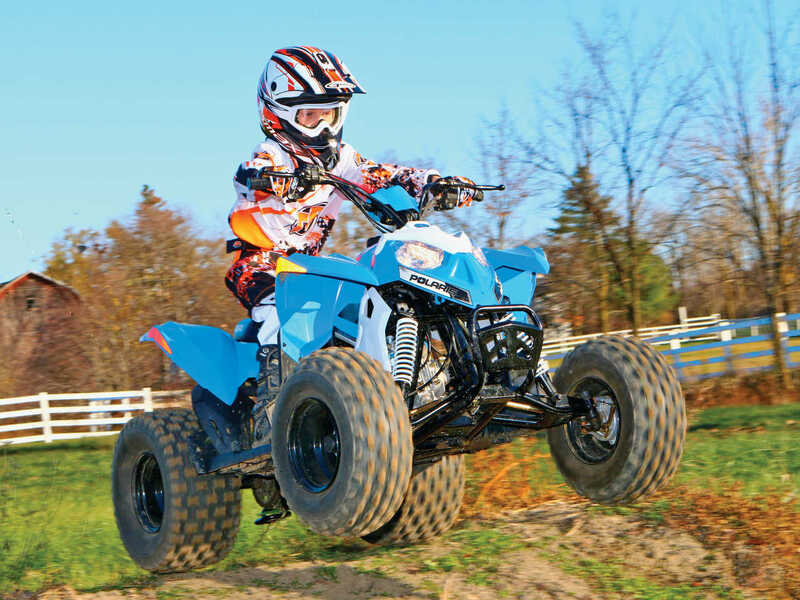 On most quads, we run the tires fairly hard for precise handling. On the Outlaw 90, leaving the pressure at the lower limit proved to offer a little more cushion that smoothed out small, choppy bumps on the trail. Steering effort seemed good as well, even at the lower tire pressure. Power delivery was quite good, especially down low where it would pull nicely. Near the top of the RPM range, torque would fall off though, and it doesn’t carry a lot of top speed. Most likely, this is due to the clutch which has been tuned for low end power. The downside is the rider’s skills are likely to advance beyond available power before they outgrow the machine. 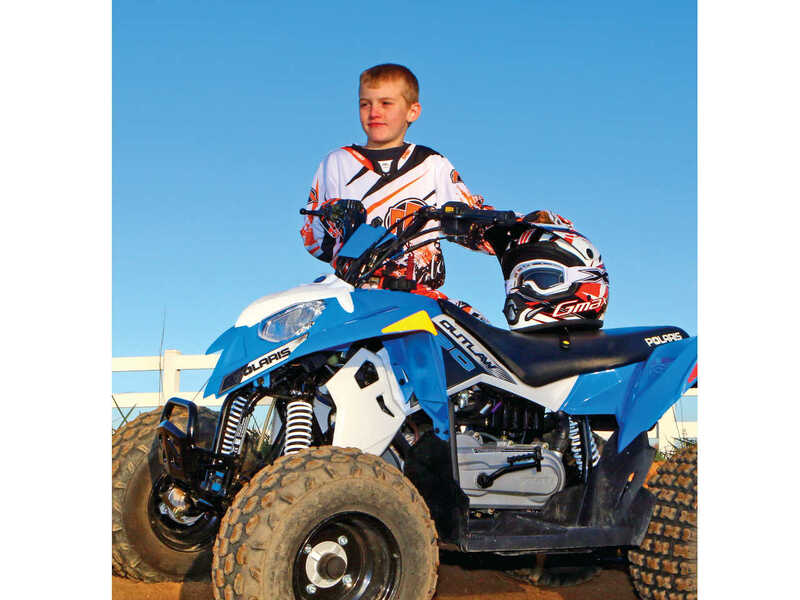 While Timmy really likes the Polaris Outlaw 90, there are a few things that could be better. The first is the throttle limiter system. A finicky throttle over-ride system can fool you into thinking you’ve got a jetting problem. This is much like we encountered in the Phoenix 200, and it can be annoying. It’s just plain touchy and difficult to adjust perfectly. In fact, it’s one of the few drawbacks to this motor. Our second major complaint is with the fuel cap which is undoubtedly in the running for the worst design in the history of powersports. For unfathomable reasons, the fuel cap threads begin FAR down the neck. This means that the cap bottoms out just as the threads begin to engage, and you have about a half turn of thread engagement at best! That is unacceptable, and actually a hazard. Do not fill this machine more than ¾ full or you will leak fuel over the tank, the engine, and yourself. How this made it through testing is beyond us. Finally, as much as we applaud the safety of a whip flag, ours didn’t last long. The glue didn’t hold and the rod came out of the mount post. 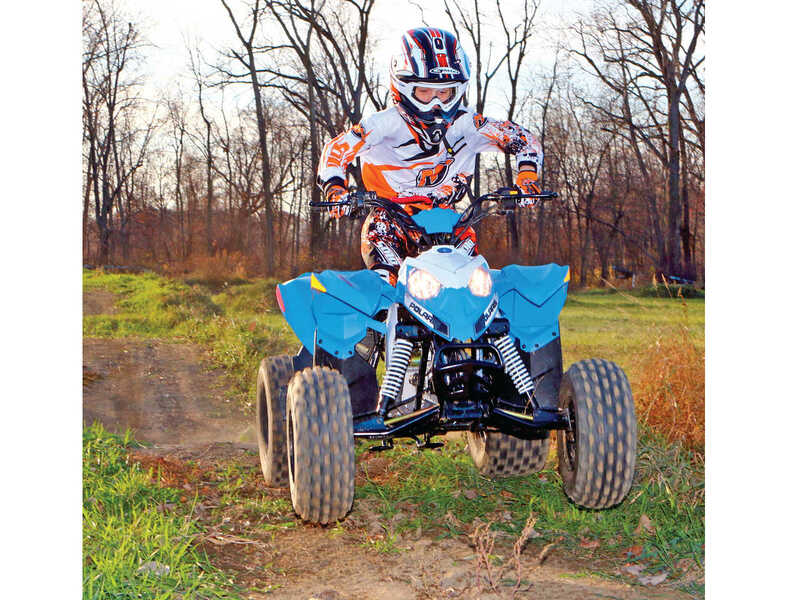 With few flaws, the Polaris Outlaw 90 is a worthy machine for new riders. It will take a little adjustment to make it perfect, but when you do, it will be a very reliable, rideable machine for junior to learn on. It’s well built, designed for years of riding, and no kid will ever be disappointed with one. It’s the great basis for new family fun and for a lifetime of riding adventures.